The paisley print use in Arabic mehndi designs. It’s look timeless and pretty or classic style. The curve motives are done in different patterns. The small design is for fingers and larger paisley on the palm. This pattern looks fantastic or fabulous. The tiny leaves and flower design and shaded to create depth used in palm. Design with petals and vines of different sizes, the design look very stylish or delicate, floral pattern is a tradition of India and Pakistani mostly girls used in wedding ceremony or specially Eid festival. This traditional Henna designs remind you the detailed architecture of traditional material that you find at an ancient Mughal palace. The dome and floral designs resemble the traditional royal residence. Paisley print is usually used in fingers like petals or small flowers. In royal tradition include raja rani or elephant pattern and floral style with large or small flowers. The Raja Rani motif is very trendy in Indian mehndi designs. The Raja Rani pattern is also very popular in Arabic or Pakistani trends. In this pattern has been drawn around the two faces. In this pattern peacock pattern elaborated the designs in Indian patterns especially for bridals. This style looks pretty with bridal outfit. It is basically Arabic tradition but Indian bridals are also used this style. This pattern used in different mehndi colors like black or red. The elephant design is one of the most trendy or different style which are used in Asia. This style is most famous in Indian bridals because this style is old Indian tradition or versa like traditional royal materials or patterns. This style relates curve and is done on each finger and Arm because its include flowers and petals pattern with dots. Colored mehndi is basically a new concept in south Asia. 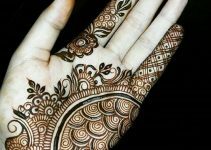 The different colors stand out in different mehndi patterns like red, yellow, blue, black, orange and green making the design more interesting and attractive. Though this new style is not a traditional style but now this style is in market or fashion industry like mehndi tattoos or stickers are available in market now. Many bridals try this style to look more stylish or trendy on their wedding day. Indian, Pakistani or Arabic bridals mostly used color glitters in mehndi patterns with red nail color. This mandala style is simple a large circle in the center of palm and makes around petals. The petals are often arranged to create a multi-dimensional simple look. Pakistani young girls mostly try this pattern in Eid or different traditional festivals. This design makes half of the one hand and the other half on second hand. This design is beautiful pattern for create love. It creates simple or classy traditional bridal look with bridal outfit or perfect stylish makeover. The main focus on this pattern is thick cuffs over the wrist. Cover the fingers with floral pattern. This pattern is twisted and unique design. This pattern draws attention with nail polish or bridal look. This design is gorgeous and eye-catching. In Arabian mehndi pattern leave the fingers empty to look simple or pretty and add a unique glove effect with painted nails. This lacy pattern is different from others and the main focus on this pattern on wrists to look trendy or traditional for bridals with nail art. The overall perfect bridal look makes different traditional fashions in fashion industry.